When someone asks you what you do, do you freeze up or start stammering? You need a concise, memorable response prepared for all the times when you’re asked about your work. This is sometimes called your “elevator speech.” Why? Imagine stepping into an elevator with your biggest prospect. She turns to you and asks, “So, what exactly do you do?” You have 30 seconds—the time it takes for the elevator to get to her destination on the 25th floor—to describe yourself in such a way that she immediately understands why you are the solution to her problems. Unfortunately, most people see their elevator speech as an opportunity to tell their life story and rattle off a laundry list of services they provide to their clients. All this does is serve to notify the victim, er, the listener that this person is more interested in talking about himself than about what he can do for his clients. 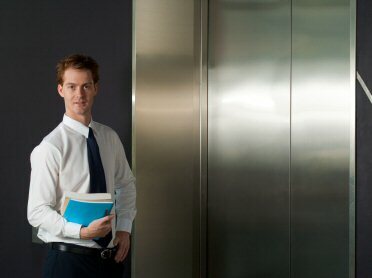 Instead, create an anti-elevator speech that focuses on results instead of activity. Three alternatives I recommend include Elevator Q&A, Elevator Ping Pong, and Elevator Story-Telling. Instead of developing a speech, remember that you just want to get a conversation going. So, when someone asks you what you do, give an answer that invites further interaction. A business researcher might say “I keep my clients from making big mistakes” or “I help my clients look brilliant”. (I learned this approach from a man who sold automated external defibrillators (AEDs) and would tell people that he was in the human jumper-cable business. If that doesn’t invite at least a “what?” from the listener, nothing will…) Think of a way to describe yourself that is intriguing, thought-provoking, or even startling. • Avoid industry jargon or buzzwords such as “solutions.” Word of mouth travels a lot farther if people outside your field understand and can describe to others what you do. • Keep it short. They’re asking you for a reason to use your services, not your life story or a laundry list of services. • Focus on benefits that provide clear added value. Talk about services that your clients can’t or won’t do for themselves and that solve a problem or help them achieve their goals. • Make sure you can deliver your introduction with enthusiasm. If you’re excited about your business, others will be as well. Practice your 15-second introduction with everyone you encounter and watch their responses. If you get a blank stare, well, you just learned one way not to describe yourself. Keep at it until you’ve found a few intros that feel genuine, you can say with passion, and that the other person understands. Everyone can be part of your word-of-mouth network if you learn how to effectively convey why people love your product or services so much. See more of my thoughts about Brand You. Love this! And, as always, consider your audience. Sometimes I can say almost the exact same thing to one person and they “get” immediately what I can do for them. Then two days later in a different environment, I may misjudge the background of someone, or assume they’re part of a certain ecosystem and I can get that blank stare. I think learning to adapt quickly to the stare is part of the challenge. By the way, a favorite ending tag line for a colleague of mine who was a financial planner was… “so, if you’re going to be a bag lady, make it a Gucci!” Very memorable 10 years later.